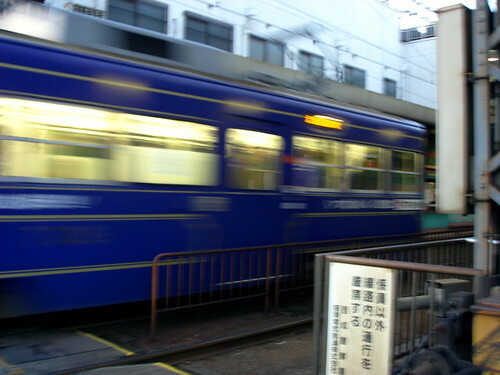 My friend Lea recently came to Japan on business, but managed to eke an extra few days of vacation time out of it and came down from Tokyo to visit me in the Kansai. Lea is just about more genki than anyone else I know, so after a week of flying between Shanghai, Seoul, and Tokyo she was still up for some massive sightseeing. 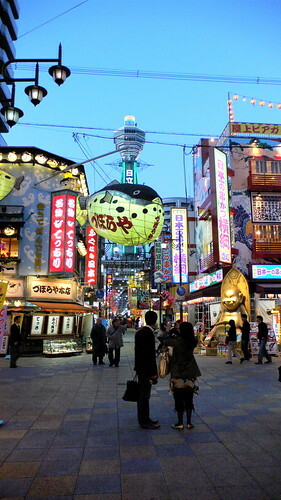 We decided to cover Osaka from South to North, so our first stop was the glorious Shinsekai area. We were going to go to Tsutenkaku Tower so I could let Lea rub the feet of the Billiken, but things were not “as they ought to be” and we arrived just about ten minutes after they closed the elevator doors. Luckily, there’s lots to do in the Shinsekai area, and Lea and I went straight to the Smartball Arcade, a vintage arcade dating from the late sixties by the look of it. Smartball is a little bit like vintage pachinko, except the balls are these giant, shiny, white plastic numbers that look like they’ve come straight out of the old 25-cent gumball machine. The best part about Smartball, other than the perfect aesthetic sense of the genius designers who built the machines, is that you can win prizes! 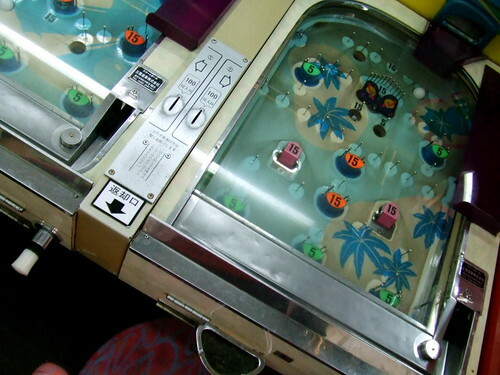 You put in 100 yen and get about twenty balls and then if you can drop them into the proper slots you get even more balls. Which you can trade for prizes! After about 30 minutes of play I had a good 200 balls to my name — enough to trade for the crappy and rather pale looking Kitty-chan doll hanging on the wall. Instead, I opted for candy. Lots of candy. Pocky, and almond choco, and some koala-cookie thing with chocolate inside, and much, much more. After Smartball, Lea and I walked the DenDen Town strip, gawking at capsule toys and vintage video games, and then did the obligatory cruise of the Dotombori where we checked out specimens of the hair that I like to refer to as “The Bon Jovi Bouffant.” In fact, after stopping for some okonomiyaki, we spotted several hair salons with young women getting their hair lifted, shaped, and curled before the big night out. It actually reminded me of the braiding and styling salons in Oakland. In Oakland, where I used to live, the braiding salons are real centers of social life and women spend serious time and serious money getting their hair done up in incredibly complicated and inventive styles before going out on the town. A similar kind of energy surrounds the beauty salons in Osaka’s Shinsaibashi area as young women in tight jeans, short skirts, and clunky boots get done up to look fine under the Shinsaibashi neon. 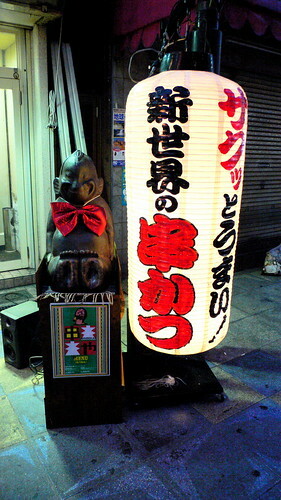 Although Lea was unable to see the actual Billiken, as a compensation prize the Shinsekai area offered up its store of myriad Billiken homages. 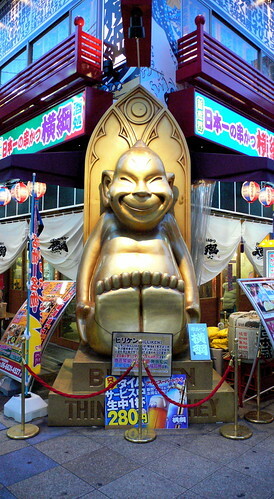 Here’s a giant golden Billiken that acts as advertising for a restaurant. This Billiken is advertising a Reggae-themed kushikatsu restaurant. I’m not sure if this is supposed to be a ‘Black Billiken,’ but it is darker than the standard Shinsekai Billiken figure. You can never have enough pictures of giant floating fugu and glowing Tsutenkaku Towers. 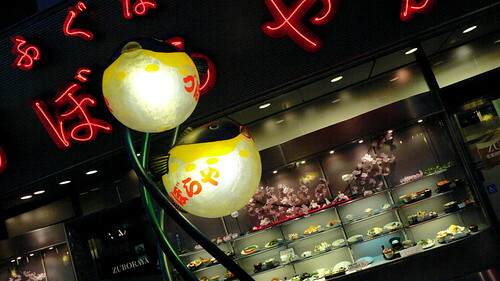 Did you know that more fugu is eaten in Osaka than anywhere else in Japan? This is the famous “Kuidaore Man.” He represents the pleasures of entertainment and eating that are historically associated with the Dotombori area. I’m really not sure what the attraction of this robot/clown/drummer/thing is, but Japanese tourists are constantly standing in front of it to have their pictures taken. 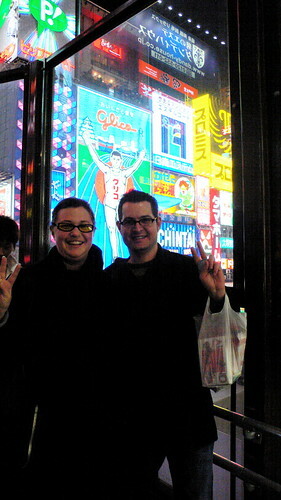 And here’s Lea and I standing in front of the world famous Glico Man sign! According to the magical counter nearby, this was precisely the eleven millionth photograph taken in front of the Glico Man sign. That fat sack in my hand is full of Smartball winnings. Mmmmm. in which 2 teenage boys ride their bikes from santa rosa to seattle for the worlds fair with a billiken in their pocket for good luck. i’ve been mildly fascinated by them ever since. starnge life for a funny looking little man. That book is so on my list! Did you notice that the cycling trip takes place in 1909? The year of Billiken’s birth!